The Curious Wavefunction: Is mathematics necessary for doing great science? Derek has a post on the value of mathematics for chemists in Chemistry World. As he says in there, while formal mathematics may not be necessary at all in a chemist or biologist's day to day work, the "mental furnishings" that math provides can be quite useful for thinking through problems. 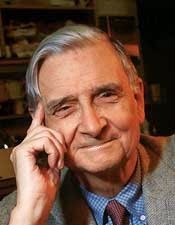 The post reminded me of my own musings on an editorial by E. O. Wilson on mathematics in the sciences which I am reposting with some additions. Writing in the Wall Street Journal, biologist E. O. Wilson asks if math is necessary for doing great science. At first glance the question seems rather pointless and the answer trivial; we can easily name dozens of Nobel Prize winners whose work was not mathematical at all. Most top chemists and biomedical researchers have little use for mathematics per se, except in terms of using statistical software or basic calculus. The history of science is filled with scientists like Darwin, Lavoisier and Linnaeus who were poor mathematicians but who revolutionized their fields. But Wilson seems to be approaching this question from two different perspectives and by and large I agree with both of them. The first perspective is from the point of view of students and the second is from the point of view of research scientists. Wilson contends that many students who want to become scientists are put off when they are told that they need to know mathematics well to become great scientists. "During my decades of teaching biology at Harvard, I watched sadly as bright undergraduates turned away from the possibility of a scientific career, fearing that, without strong math skills, they would fail. This mistaken assumption has deprived science of an immeasurable amount of sorely needed talent. It has created a hemorrhage of brain power we need to stanch." I do not know if this is indeed what students feel, but at least on one level it makes sense. While it’s true that chemists and biologists certainly don’t need to know advanced mathematical topics like topology or algebraic geometry to do good science, these days they do need to know how to handle large amounts of data, and that’s a trend that only going to grow by leaps and bounds. Now analyzing large amounts of data does not require advanced mathematics per se – it’s more statistics than mathematics – but one can see how mathematical thinking can help one to understand the kinds of tools (things like machine learning and principal component analysis) that are standard parts of modern data analysis. So while Wilson may be right that professors should not discourage students by requiring them to know mathematics, they also should stress the importance of abstract mathematical thinking that’s useful in analyzing data in fields ranging from evolutionary biology to social psychology. You don’t have to be a mathematician in order to think like a mathematician, and it never hurts these days for any kind of a scientist to take a class in machine learning or statistics. At the same time Wilson is quite right that true success in science mostly does not come from mathematics. In many fields math is a powerful tool, but only a tool nonetheless; what matters is a physical feel for the systems to which it is applied. As Wilson puts it, “Far more important throughout the rest of science is the ability to form concepts, during which the researcher conjures images and processes by intuition”. In Wilson’s own field for instance, you can use all the math you like to calculate rising and ebbing populations of prey and predator, but true insight into the system can only come from broader thinking that utilizes the principles of evolution. In fact biology can claim many scientists like John Maynard Smith, J. B. S. Haldane and W. D. Hamilton who were excellent mathematicians, but the fact remains that these men’s great contributions came from their understanding of the biological systems under consideration rather than the mathematics itself. In my own field of chemistry, math is employed as the basis of several physics-based algorithms that are used to calculate the structure and properties of molecules. But most chemists like me can largely get away by using these algorithms as black boxes; our insights into problems comes from analyzing the results of the calculations within the unique structure and philosophy of chemistry. Knowledge of mathematics may or may not help us in understanding molecular behavior, but knowledge of chemistry always helps. This also speaks to the limitations of reductionism in a field like chemistry which I have often written about before. As Roald Hoffmann put it quite memorably, chemical concepts like aromaticity and electronegativity start "fraying at their edges" when you try to make them too precise through mathematical manipulation. It's far better to have a semi-qualitative idea that's actually explanatory than a six-decimal calculation that sheds no chemical insight. And even in a bona fide mathematical field like quantum chemistry the distinction between “using” math and “knowing” it is quite clear; I don’t really know the math behind many theoretical calculations on molecules, but I certainly use it on a regular basis in an implicit way. What’s interesting is that mathematics is not even a game changer in the world of physics, the one field where its application is considered to be essential. The physicist Eugene Wigner did write an essay named “The Unreasonable Effectiveness of Mathematics in the Natural Sciences”, but even the greatest theoretical physicists of the twentieth century including Einstein, Fermi, Feynman and Bohr were really known for their physical intuition than for formidable mathematical prowess. Einstein's strength was to imagine thought experiments, Fermi's was to do rough back-of-the-envelope calculations. So while mathematics is definitely key to making advances in fields like particle physics, even in those fields what really matters is the ability to imagine physical phenomena and make sense of them. The history of physics presents very few examples – Paul Dirac’s work in quantum mechanics and Hermann Weyl's work in group theory come to mind – where mathematical beauty and ability alone served to bring about important scientific progress. This use of mathematics as little more than an elegant tool relates to Wilson’s second point concerning math, this time in the context of collaboration. To me Wilson confirms a quote attributed to Thomas Edison who is purported to have said, “I can hire a mathematician but a mathematician cannot hire me”. Most non-mathematicians can collaborate with a mathematician to firm up their analyses, but without a collaborator in the physical or social sciences mathematicians will have no idea what to do with their equations, no matter how rigorous or elegant they are. The other thing to keep in mind is that an over-reliance on math can also seriously hinder progress in certain fields and even lead to great financial and personal losses. Finance is a great example; the highly sophisticated models developed by physicists on Wall Street caused more harm than good. In the words of the physicist-turned-financial modeler Emanuel Derman, the modelers suffered from "physics envy", expecting markets to be as precise as electrons and neutrinos. In one sense I see Wilson's criticism of mathematics as a criticism of the overly reductionist ethos that some scientists bring to their work. I agree with him that this ethos can often lead one to miss the forest for the trees. The fact is that fear of math often dissuades students and professionals from embarking on research in fields where data analysis and mathematics-type thinking are useful. Wilson’s essay should assure these scientists that they need not fear math and do not even need to know it too well to become great scientists. All they need to do is to use it when it matters. Or find someone who can. The adage about mathematics being the "handmaiden of the sciences" sounds condescending, but it's not, and it's fairly accurate. I think that perhaps one might hesitate to discuss physics and math that way. Math in physics is akin to breathing in humans - it doesn't make it what it is, but if it's not there, things are pretty much dead. Meaning, if you can't do some serious math without having to think about it, you won't be able to do physics at a research level either, something which has been true for something like a century and a half - the last really impactful figure without lots of math in their work is often reckoned to be Faraday. To a large extent. Even experimentalists need to have a quantitative feel for the phenomenon they are trying to probe. In fact the more you read about the history of physics, the more you realize that the best experimentalists (Rabi, Lamb, obviously Fermi, even Lawrence) had this talent. I think Hermann Weyl also solved the Schrodinger Equation because Schrodinger didn't have enough math skills to solve it. Please correct me if I am wrong. I have to say I was unaware of this! Is there a reference you can point me to?